We appreciate rituals at NCN. And surely the run up to a statewide, presidential primary election is nothing if it is not ritualistic. And one need only look at the many slideshows on the recent Iowa caucuses and the New Hampshire primary to take a measure of the homespun, hand shaking, baby kissing, “impromptu” barbershop/hardware store/local diner visiting, town hall meeting rituals that are repeated ad nauseum, state by state, party by party, and year after year. Given that the current primary election season begin nearly a year ago and has been running virtually nonstop ever since, one might expect that we would have something to say about the way in which it has been documented photographically within the public, visual culture. But the truth of the matter is that the various campaigns have been something of an embarrassment, more a caricature of themselves than anything else. If someone like Mel Brooks were to spoof the current contest for the Republican nomination it is impossible to imagine how he could cast it better than to have the candidates play themselves or how he could script it better than to have them repeat their own lines on cue. We simply have not been able to bring ourselves to speak to the issue because, for the most part, the photographic record has followed the pattern of a timeworn template of visual tropes that have represented this campaign and the various pretenders to the title of “the not Romney” as if it was like any other. It isn’t, of course, but photographers have had a difficult time documenting the differences. The photograph above may be a good star at challenging the norms, in its own way a perfect parody for the present primary campaign season. One of the goals of a primary political campaign is to give the candidates an opportunity to metaphorically “iron out the wrinkles” in their positions and policies. That hasn’t happened, of course, as just about every candidate has taken his or her turn rising to the top only to fall all over themselves in slapstick fashion, their wrinkles intact and in most cases all the worse for the wear. But in the end there is Governor Romney, his hair carefully coifed and even his American flag—captioned and signed—carefully (one might say “obsessively”) steam ironed so that none of its wrinkles will show. What began as a metaphor to explain the political process in the language of everyday life has returned, in all of its banality, as a literal practice. 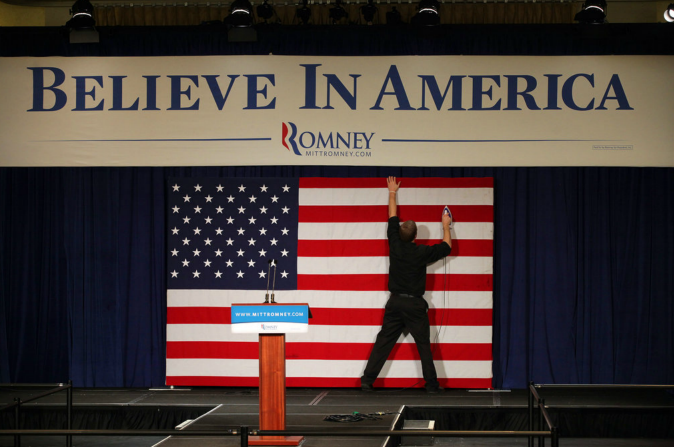 As such, the photograph suggests, the stage is empty, as is the campaign itself writ large … little more than a vacant podium, a flag that is being prepared by a stagehand to give the illusion of being perfect, and an empty platitude. It is hard to believe that this is any way to elect a candidate for the presidency.